Afghanistan is a land of continuity and contradiction: stark yet beautiful, hospitable yet treacherous. It is the essence and colour of the barest earth. Its people, even in extremis adorn their surroundings and themselves with colour and jewels. Its most precious stone, lapis lazuli itself holds a contradiction. Blue like the deepest ocean, grown in a land which could not be further from or least resemble the sea in its high, hard, dryness. This is a land where the blue of its lakes sits strangely in rocky treeless deserts. The Bamiyan Valley situated to the north of the capital Kabul is a deceptive landscape. It holds many secrets: centuries ago people dug themselves dwellings deep inside its unforgiving mountains to find sanctuary from invading hordes – evading even Ghenghis Khan. This valley has looked over the comings and goings of courageous yet insignificant humanity while its dusts eventually reclaim homes and wither crops. Monuments to the spirit last a little longer there. 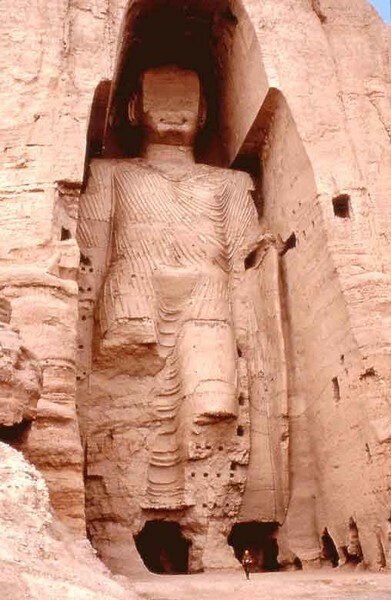 The Great Buddhas of Bamiyan were among the last enduring symbols of ancient peoples who tried to make their mark by carving mountains. While twentieth century hordes with their current hatreds may have destroyed them with strong guns, they will fail ultimately to penetrate the eternal spirit which created them or to possess the land itself. How much braver it is to fashion a mountain in an image of love than to bombard it with mortar shells. The Buddhas will become a mountain once more and retreat to the safety of memory. The guns will eventually join the decaying archaeology of previous tides of fear which have swept this land but failed to conquer its silent unyielding majesty. The Bamiyan Valley bears timeless witness to the necessity and futility of human action.